Below is all the information I have been able to collect about "Kaprosh," a dance that appears in 2 yizkor books (so far) and is notated (musically) in an old, unpublished Yiddish manuscript. If you know anything about this dance or song, especially as it may relate to Jewish variants, please contact me. What you will find if you scroll down this page are: Sound clips of the Ukrainian version of the song, yizkor book excerpts/archival sources where the kaperush/kaprosh dance is mentioned, and finally a rough translation of the Ukrainian lyrics to the song as well as the Ukrainian version of the dance. It is likely that the spelling of Kaprosh was erroneously created, due to transcription into Hebrew and then back to English (see Hebrew text). Here is a dance video of a performance a Ukrainian stage version of Kaperush, https://www.youtube.com/watch?v=golsNTehabs . Although performed in a more spectacular manner than the Jewish versions described below, it gives the general idea of the dancers imitating the movements of the leader, and being penalized for not following correctly. Yizkor book excerpts and archival sources that mention "kaprosh"
"He was a good conversationalist. He was able to tell stories and gather around him interested people who would drink up his words with thirst, words that were spiced with humor and jokes. Despite his Hassidic appearance, he did not hesitate at weddings to be at the head of those who entertained and dancfront of the bride and groom. He speedily removed his outer cloak and hat, and with a kippa (skullcap) on his head he began to sing and dance "keitzad merakdim, keitzad merakded in im" . Accompanied by the enthusiastic group of singers and dancers, he would speedily arrange the well-known "Kaprosh" dance. He would direct it and issue the orders. Woe to the dancer who was not able to remove his shoe quick enough after been issued the command, or to take out his fringes from the four corners. He would have to pay good money to the band." Does anyone remember the violinist Jakob (Yankev) Zeltser, or any of the other musicians that played weddings in Stanislav and vicinity before the war? Or wedding songs like "Shrayt shoyn 'Mazel Tov'", "Ot Azoy Makht Men Khasene Kinder" and "Chipkelakh mit Fasolyes"? "(1) The A sections are the same, except for the key, and also on the second clip the B section is cut off, so it might very well be identical. (2) very often, Ukrainians play kolomeykas and such (which we would call a type of freylekhs) considerably faster than Jews would play them. However, the kaperush (both clips) is moderately fast, has a nice "Jewish" feel to it. I really like them. (3) it never fails to amaze me how much information about a given piece of music is NOT captured by a notated transcription, especially when it is a mere lead sheet. Your clips give a much better idea of the music than what I have. To me the clips sound as Jewish as they do Ukrainian. (4) that being said, I can tell you that the A section as I have it is nearly identical to what's on your clips; the B section is a little different, but not very. The writing (in Yiddish) is: "One man leads the dancers. All the movements that the leader makes must be imitated by all the others. When one of them does not imitate it, he pays a fine." "shtrof" could be translated "penalty," but in any case I think money is meant. Very little money, of course, but it would add up, and I assume the pot would have gone to the klezmorim." No lyrics were provided within the musical notation. ""Kabinya Marisya" is actually a very well-known kolomeyka with the a section in minor (it's not THE "Jewish" kolomeyka in mi-sheberekh mode), but I don't know whether it always goes under that name. The tune is also called a kozatchok. There is a recording of some of these by Shloimke Beckerman on a cassette available from Kurt Bjorling, and one of the tunes is this. If I recall, there are four sections, the first in minor, the second in the relative major, the third in mi-sheberekh, and the last in minor. This rough translation of the Kaperush lyrics and instructions was contributed to the Jewish Music mailing list by Bob Rothstein on March 5, 2009. Many thanks. Don't touch what isn't yours because you'll be punished! The "leader" approaches each man in the room in turn, puts his right hand on his shoulder and puts the person behind him, thus gathering players. When all who want to have joined Kaperush, they all stand in a single circle. The "leader" shows various movements, for example, he hops on one foot, walks in single file, waves his arms, dances with a girl, kisses a girl, picks her up in his arms, etc. The other players have to repeat everything that the "leader" shows. If someone doesn't perform the activity or doesn't perform it correctly, the "leader" hits him painfully with the belt - so that others wouldn't be inclined to do the same. 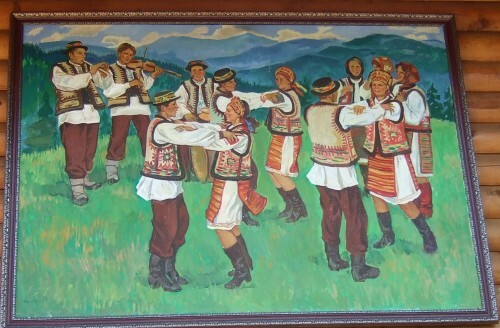 2) "...a Bukovyna dance called Keprush, very lively, with young men in typical costume dancing in a circle and in groups of two, joined by young ladies with whom they dance in pairs. https://www.youtube.com/watch?v=ZFbcCnPdcDM "